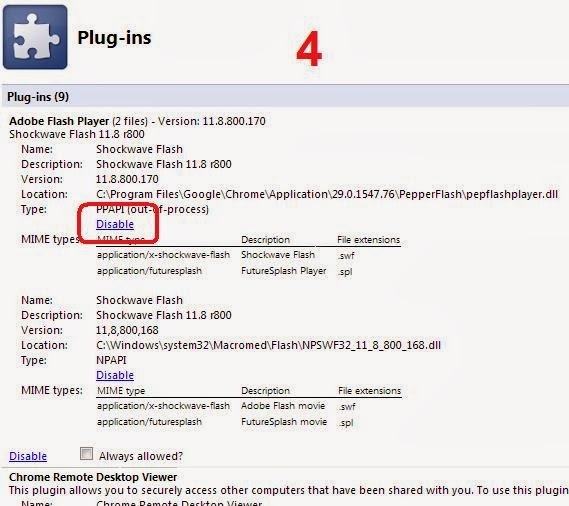 PepperFlash is a version of Flash Player that comes bundled with Google Chrome. In general, it works well on most systems. However, on some websites or hardware configurations, a different version called Adobe Flash Player plugin reduces stuttering and improves general video playback performance. PepperFlash can be easily disabled, and Adobe Flash Player plugin can be installed in its place, but a problem that many people have encountered is that PepperFlash keeps re-enabling itself, especially when a Chrome update takes place. These instructions should keep this from happening. Please note that this will only work with a system-wide installation of Google Chrome installed to its default location in C:\Program Files. 1. Download and install Adobe Flash Player plug-in from the following address: https://get.adobe.com/flashplayer/?fpchrome. Remember to un-tick the box to install McAfee Security Scan Plus. 2. Once the installation is complete, close and re-open Chrome, then type about:plugins into the Chrome address bar at the top of the screen and press enter. 3. Click the + symbol next to Details in the top right corner of the page that appears. 4. On the left of the page, under the heading Adobe Flash Player, there should be two versions of Flash Player showing: The PepperFlash version that is stored in the Chrome program folder and the plug-in version that is stored in the Windows folder. Click on the Disable link underneath the PepperFlash listing. 5. Download the following file: https://sites.google.com/site/wintegrity01/ChromeLaunch.zip. Unzip the file, then double click on INSTALL. This will place another icon on the desktop called ChromeLaunch with a golden Chrome icon. Double clicking this icon to launch Chrome should ensure that PepperFlash remains disabled. - As ChromeLaunch makes a modification to the folder in which Chrome is installed, administrator rights are required. Click on Yes or Continue if a warning message appears when double clicking the icon. - Your Anti-virus scanner may detect unusual activity because ChromeLaunch is making a change to a system folder. The program must be able to make these changes to be able to work.